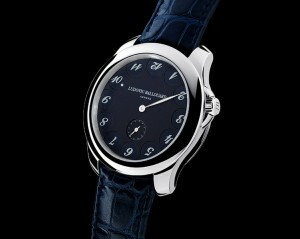 Ludovic Ballouard first worked with Frank Muller for 3 years before joining Francois-Paul Journe for 7 years. In 2009 Ludovic Ballouard decided to launch his own company. The same year he created his first watch “Upside Down”. In October 2010, Ludovic Ballouard was awarded the “Special Prize of the Jury” by the prestigious magazine “Montres Passions” during the “Watch of the Year” event in Geneva. Since its creation the Upside Down has become a most successful watch. 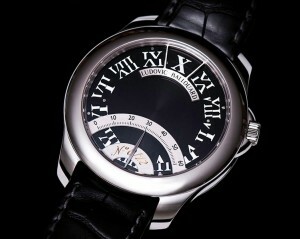 Fuelled by his usual creativity and enthusiasm, Ludovic Ballouard presented his second timepiece in January 2012. An impressive complicated platinum timepiece called Half Time, confirming his inspiration for awesome displays. By turning upside down within a complex movement, Ludovic Ballouard presents lovers of watch mecanisms with a lot of technical subtleties together with an authentically poetic timepiece. “Half time” is made on the same principle; all the hour indexes are divided in two, therefore unreadable… all except the one showing the current hour. The rotation of two disks « reconstitutes » each index, allowing time to be read. A retrograde hand, set on a half-circle at 6 o’clock indicates the minutes in a classical manner.